Payment: Accounts must be settled on departure. We accept Cash, credit and Debit cards: American Express, MasterCard, Switch, Visa, JCB International Credit Card, Visa Debit and Visa Electron. Cheques are not accepted. Deposit: First night payment is taken as a deposit, this is fully refundable up until 48hours prior to arrival, after this time the first night is non-refundable. This does not apply to groups, (please see group T&Cs) or Advance Purchases. Cancellation: Free cancellation 48 hours prior to arrival, after this time first nights payment is non-refundable. This does not apply to groups, (please see group T&Cs) or Advance Purchases. 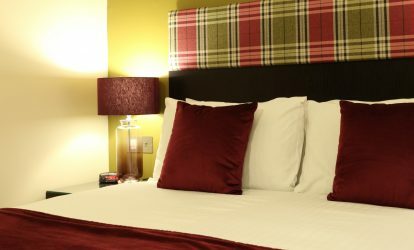 Deposit: A £25.00 per room non-refundable non-transferable deposit at the time of booking. Payment: Full payment is due 21 days prior to arrival, after this the booking is non-refundable or amendable. Cancellation: After the booking has been paid for in full the booking is non-refundable. No alterations can be made after payment. Check in and out: Rooms are available from 3pm onwards on day or arrival and must be vacated by 11am on the day of departure. Guests from outside Great Britain are requested to present their passport on check in. Damages: We reserve the right and you hereby allow us to charge your credit or debit card for any damages incurred to your room or the hotel during your stay. CCTV: Most public areas of the hotel CCTV is in operation and video recording may be made. This is carried out for the security for all guest and staff. Force Majeure: The Clan MacDuff Hotel cannot accept responsibility or pay any compensation for unforeseen circumstances beyond our control. These include (but are not limited to) adverse weather conditions, natural disaster, other acts of God, fire or failure of electric power, gas, water or other utility service, terrorist activity or treat, injuries and death of an individual(s) through accidental circumstances unconnected with the hotel. Guest behaviour: We require guests not to disturb the comfort and enjoyment of other guests, cause offence to other guests or our staff members. If guest continue to disturb others or cause offence they will be asked to leave the premises. Parking: Onsite parking is available free of charge. The Clan MacDuff Hotel and Restaurant does not accept any liability for any damages or theft to vehicles using the car park. Smoking: The Clan MacDuff Hotel & Restaurant is a non-smoking establishment (including e-cigarettes). Failure to comply with this policy results in a £150.00 fine per guest.